If you had any doubts, just look to Wall Street this morning. 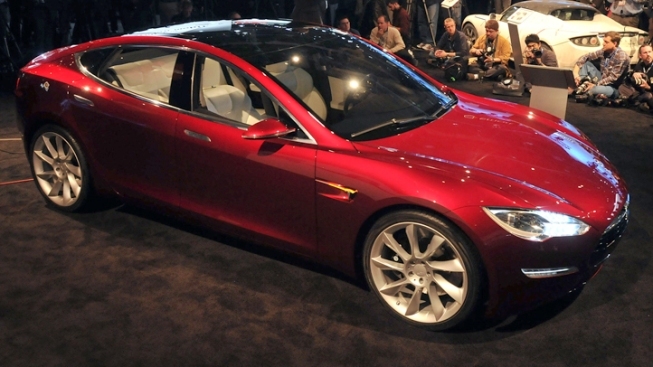 Shares of Tesla Motors stock (TSLA) have soared about 25 percent so far this morning. Over the last couple of months, the share price has doubled, adding close to four billion dollars to its market value. Even more impressively (at least for me, a non stock holder), look at your local roadways. Teslas are everywhere these days. They're outselling The Chevy Volt and the Nissan Leaf, despite the fact that the Model S is much more expensive. What was at first a trickle of Teslas in the wild has become a steady stream. According to the company's latest earning report, Tesla sold 4,900 cars over the last three months, with sales expected to pick up even more steam in the month ahead. Net income for the quarter was $11.2 million dollars, sharply up from the $89.9 million dollar loss recorded the year before. On top of all that, Consumer Reports just published a very favorable review, giving the Model S a 99 out of a possible 100 rating. Yowza. This from the magazine that couldn't bring itself to recommend the iPhone 5. There are, of course, future roadblocks in the way for Tesla. But recently, at least, this company has done just about everything right, and it's being richly rewarded.